Herbes de Provence, an essential component of French and Mediterranean cooking, is a mixture of dried herbs that adds a distinctive flavor to dishes such as chicken, roasted vegetables, grilled fish, salads, tomato-based soups, and stews like ratatouille. Herbes de Provence originated in the southeastern region of France, where summertime herbs are plentiful and used in daily cooking. But it only became familiar in the 1970s, after Julia Child began teaching home chefs around the world about French cooking, and when commercial varieties of the mixture began popping up in grocery stores. Nowadays, even though fresh herbs are readily available in markets, it's not always possible to find the ones you want—making dried herbs a must-have ingredient. And while you can purchase herbes de Provence in most grocery stores, it's just as easy to make your own. Plus, when you make your own you can adjust the amounts and ingredients according to personal taste. There are many herbs (and spices) that can collectively be called herbes de Provence, but the basic recipe includes basil, fennel, marjoram, parsley, rosemary, tarragon, and thyme. Other recipes variously include (or omit) crushed bay leaves, savory, chervil, sage, oregano, and mint. Despite its ubiquity throughout Provence, lavender was not traditionally included in the mixture; it is often found in the commercial versions, however. Lavender adds aroma and has a strong—some say soapy—flavor. 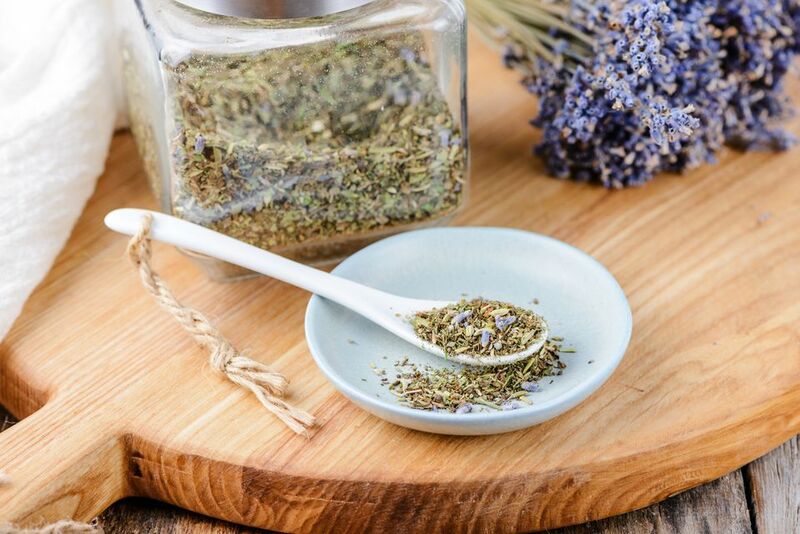 If you include it in your homemade herbes de Provence, be sure to buy culinary lavender buds specifically marked for cooking, and use it sparingly—lavender can easily overwhelm sweet and savory foods. Certain herbs are known to pair well with particular foods: rosemary with lamb; tarragon with chicken, basil with tomatoes; and fennel with fish. Keep these combinations in mind when mixing your herbs. You might want to try making separate batches, each with different ratios of herbs, for use in various recipes. Just be sure to label your containers! For an easy Provençal chicken dinner, coat a skinless chicken breast in olive oil and sprinkle both sides with kosher salt and herbes de Provence, marinate for an hour or so, then grill. Or season skin-on chicken thighs the same way, then braise with white wine, tomatoes, and halved shallots. Grind the fennel seeds and rosemary in a spice grinder. Pour into a mixing bowl. Stir in the remaining herbs. Use to season meats, chicken, fish, salads, vegetables, soups, and stews.